Deciding where to distribute your real estate video is a lot like positioning your yard sign on a client’s lawn. You want to make sure it’s seen by as many eyeballs as possible. The same strategy applies to video. With over 90 percent of all video traffic on YouTube — the second-most used search engine in the world behind Google — it’s a no-brainer to start there with the most popular type of video homebuyers look for: community information. In general, people want to know about “where” they are going to live before they are ready to look for “what” they are going to live in. Think about YouTube as the very top of the sales funnel, or as the biggest net to capture the most fish. Buyers don’t start searching for “123 Main Street, Anytown 32828.” They search to learn more about “Anytown,” then drill down to specific neighborhoods or streets. For this reason, YouTube is a terrific channel to build your personal brand as the go-to expert in a specific community, or targeted neighborhood within that community. Use your current sphere of influence as a guide to what makes sense, then consider where you want to grow and drill down from there. Before you do anything, make sure your video has a keyword-rich description. For example, let’s say you’re uploading a community-based video, as mentioned in my list of YouTube’s top five types of real estate videos. You’ll want to include keywords that best describe your neighborhood tour in your file name, like “Shady Grove Wisconsin Neighborhood Tour”or “Shady Grove Wisconsin Historic Homes District.” You get the idea. Once your community video is posted to YouTube, copy and paste the link to your Facebook page. Recent studies show video views on Facebook have more than doubled since November, so this is a distribution outlet that you definitely don’t want to overlook. You might even want to consider splurging on Facebook’s $7 promotional feature to push the video onto more of your friends’ walls, furthering the video’s exposure … and consequently, your influence. 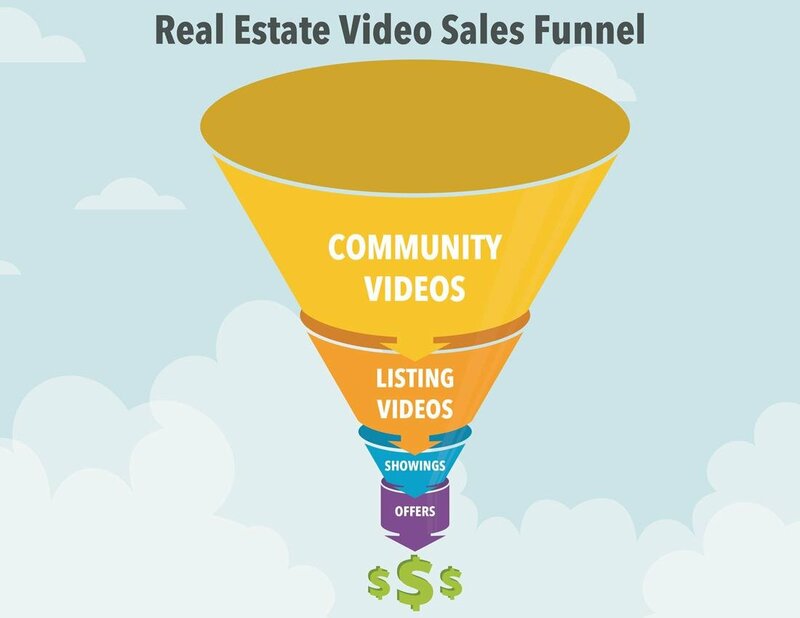 In addition to community videos on Facebook, property videos are also crucial on your broker’s website, as it helps towards the bottom/conversion part of the sales funnel (after you’ve captured their attention with the community video) — being that your website is where buyers go when they are ready to act. When you do create video to promote what it is like to live in a home you have listed, don’t forget to geotag the street address of the property. Search engines love geotags. Next, tweet your videos to your Twitter followers and don’t be shy about asking for retweets. Now that you’re on the top two social media sites, don’t forget to post it to real estate portals like Zillow.com, Trulia.com, Homes.com and realtor.com as well. What about other video-sharing sites like Yahoo! Screen, Vimeo and Metacafe? Instead of uploading to each individually, consider using TubeMogul. TubeMogul is a video syndication portal much like ListHub.com and Point2, which are great partners to syndicate your listings. A free membership to TubeMogul gets you 100 automatic posts per month to video-sharing sites where you’ve set up an account. For most agents, 100 per month is more than enough to launch a powerful video campaign. Getting your video in front of more eyeballs is crucial. But how can you be sure they’ll watch until the end? Studies show the sweet spot is around 60-90 seconds. After that, 50 percent of viewers stick around till the two-minute mark. Once you exceed two minutes, viewers abandon the video far earlier than they would have if the video had been shorter — never even making it to your contact information. The only videos that warrant exceeding two minutes are education-based, tutorials or webinars, where the audience wants to learn in-depth about a topic of interest. For more in-depth information about video marketing, check out ReelSEO or our VScreen video blog for some free do-it-yourself tips from yours truly.